Smith’s story offers unbridled inspiration to others attempting to get back on their feet after tragedy strikes. 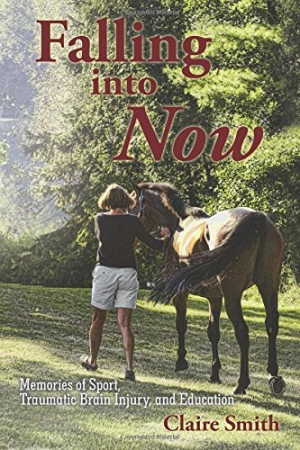 Olympic equestrian Claire Smith’s memoir Falling into Now is about struggling to adapt to life after she sustains a head injury when her horse falls during competition. As part of her healing process, Smith wrote this detailed account of the physical and emotional trauma. Diary-like entries come in a travelogue format, roaming from the frigid Canadian winters to the warmer climate of North Carolina, and explore the challenges involved in redefining her core identity and once narrowly focused goals. Segments are organized thematically into chapters, including “Horses,” “Chaos,” “Restitution,” “Quest,” and “(Re)Adjusting.” Many sections are identified by locations and dates, orienting their events before and after the life-altering accident. The perspective constantly changes as Smith struggles to make peace with her fundamentally altered life. In addition to capturing her own raw state during her arduous recovery process, Smith crafts insightful sections from her parents’ viewpoints. These additional layers to her story excel at acknowledging the pain and strain that family members and friends feel when a loved one struggles with a serious injury or illness. Smith’s ability to perceive the way her tragedy has impacted others’ lives is a rare quality that elevates the work and offers lessons beyond the personal. Vivid and moving writing, particularly about Smith’s beloved horses and dogs, elicits emotional responses. Strong black-and-white photographs of Smith with her beautiful animals provide a personal touch. Smith’s gift for raising awareness about the “invisibility” of people using wheelchairs, and her disdain for pity, are some of the triumphs in her story. During Smith’s extended recovery process, a few questions remain unanswered. In particular, the source of her lack of fear when she gets back on her horse is never addressed. Her loss of interest in competitive riding also remains unclarified. Some points are insistently repeated, such as about the impossibility of returning to her previous life; these frustrations naturally reflect Smith’s bumpy ride and slow trajectory toward discovering a new identity. Smith’s determination to redirect her goal-oriented nature toward completing advanced academic degrees results in a particularly fascinating outcome. Her new interest in writing and in research about the power of creativity to speed the healing process after brain injuries is the book’s ultimate hopeful note. Falling into Now shows a strong woman surviving and thriving after a tragic accident, offering unbridled inspiration to others attempting to get back on their feet and move forward.